On meeting someone new, it is not uncommon for them to ask me, ‘So how long have you been a writer?’ and I inevitably reply with, ‘All my life.’ The truth is that it’s taken a goodly proportion of my life to gather the confidence and conviction to claim the title of writer. I’m not yet aged enough to fall into the category of ‘older emerging writer’, but I am old enough to miss out on the opportunities reserved for younger emerging writers. I know about this firsthand; I am now too old to strive for my childhood dream of winning the Vogel Award and there are plenty of other awards and grants closed to me for no other reason than advancing years–though, to be fair, there are some opportunities closed off to younger writers too . While I think it’s important to encourage young people to write, it’s also important to note that writers do not have best-before dates. Age proffers rare gifts. It can bring focus and measure to passion, realism and patience to publication submissions, fierce insight, and first-hand life experience. I’m not saying that a younger writer can not possess these traits; my unscientific observation shows these characteristics emanate from the level of sacrifice you have to make for your craft (eg. family time, social activities, well-paid/secure employment), the level of commitment and sheer stubbornness, and keen observational skills, rather than your age. Talent also accounts for little in any age bracket. It won’t change the fact that you actually have to sit down and write your work of literary genius–except, of course, if you happen to have your own ghostwriter . Frank McCourt was 66 when his memoir, Angela’s Ashes, was published. I can glean a number of learnings from the journeys of these writers, just two of them being: (1) even if I don’t have my first novel published for another 12 years, I’ll still have a 10-year head start on Daniel Defoe; and (2) time is such a ridiculously arbitrary construct by which to motivate an output. Yes, it’s a shame to have missed out on the chance to win a few well-endowed awards, but who’s to say I would have been competitive anyway? Besides, there are other opportunities to be had, and this is the right time for me to write. I can say with certainty that age is no defining factor when it comes to producing stirring poetry and prose. Black, R. (2015) “What’s So Great About Young Writers?” on The New York Times. Available online via http://www.nytimes.com/2015/04/25/opinion/whats-so-great-about-young-writers.html?_r=0 [last accessed: 18 May 2015]. Campbell, J. (2010) “What the ghostwriter saw: ‘I write, they take the credit’ ” on The Independent. Available online via http://www.independent.co.uk/arts-entertainment/books/features/what-the-ghostwriter-saw-i-write-they-take-the-credit-1932674.html [last accessed: 18 May 2015]. Goldhill, O. (2015) “Six novelists who didn’t publish until they were 40” on The Telegraph. Available online via http://www.telegraph.co.uk/culture/books/11508733/Six-novelists-who-didnt-publish-until-they-were-40.html [last accessed: 18 May 2015]. Turner, K. (2013) “Five Authors Who Prove It’s Never Too Late To Start Writing” on LitReactor. Available online via https://litreactor.com/columns/10-authors-who-prove-its-never-too-late-to-start-writing [last accessed: 18 May 2015]. Painter, G. S. (2015) “Marcel Proust” on Encyclopedia Brittanica Inc. Available online via http://www.britannica.com/EBchecked/topic/480557/Marcel-Proust [last accessed: 18 May 2015]. 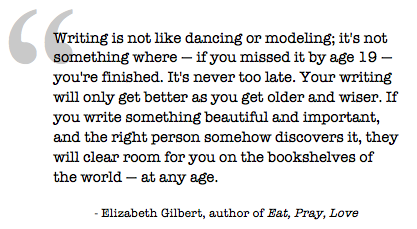 Tags: Daniel Defoe, Elizabeth Gilbert, Frank McCourt, George Eliot, Hunter S. Thompson, Marcel Proust, Mark Twain, On being an older emerging writer. Bookmark the permalink. Previous post ← Happy Dance.